An edited version of a presentation by Trevor Purnell to the Cumbria Industrial History Society in April 2006. Photos courtesy of BNFL. West Cumbria before the Atomic Age was heavily dependent on coal and steel for employment. Seventy or more coal and iron ore pits were sunk in the Whitehaven area over 300 years. During that time over 500 miners lost their lives; in Whitehaven itself 136 in 1910 and 104 in 1947. During the severe depression in west Cumberland in the 1930s there was very little work, so the area was delighted when Nikki Sekers opened his silk mill at Hensingham (making I believe 10,000 parachutes during the war). Edgards made military uniforms in their Barrack Mill in Whitehaven, in 1938 Kangol opened a factory to make berets in Cleator, and in 1941 Schon & Marzillier moved from London to escape the bombing and opened their factory – Marchon – in Whitehaven, which by 1955 was the town’s largest employer. Sadly all these enterprises have now closed down. Thanks to the requirements of the war effort, for those not called up the chance of employment increased when Royal Ordnance Munitions Factories opened at Drigg in 1940, and at Sellafield in 1942. Three and a half thousand contractors were drafted in to build this latter plant which began TNT production in May 1943. It had a 30″ gauge railway, 82 process buildings, and laboratory blocks which were later bought by Marchon! In 1943, all British scientists working on atomic energy were moved to the USA which was remote from enemy air bases. The Americans also had more manpower available to work on the atomic bomb project. Within 3 years came Hiroshima. In 1946 the US Congress passed the McMahon Act to prevent other countries sharing its nuclear knowledge. It was known that if an atomic chain reaction could be controlled then an enormous amount of heat would be given out during nuclear fission. Great Britain could not afford to ignore this new source of energy as there was increasing difficulty in obtaining coal. Also it was thought by the government that because of the Cold War we should have an independent nuclear deterrent, in other words our own atomic bomb facility capable of producing plutonium. Speed was of the essence but where to build? Ordnance factories were closing down, so a redundant site near Warrington – Risley – was chosen as the headquarters for the design team. The inexperienced (in nuclear matters) British engineers had had no access to the atomic pile at Oakridge, Tennessee. (Called a pile because the original experimental 1942 reactor was built in a squash court using a pile of graphite as a moderator). They were considering building a water cooled pile to take away the excess heat, but it was known that if the coolant was lost or leaked away there could be a nuclear incident, so a site with an abundant supply of pure water and fairly remote from civilisation would be required. (Later it was realised that if the cladding – the sealed magnesium alloy can – around the uranium fuel could be fitted with fins then a more inherently safe air-cooled reactor could be built). To fit the bill It was thought necessary to look for a site in North West England or West Scotland. Somewhere near Wastwater looked promising, and there were several Ordnance factories in the area which were possibly closing down – Bootle, Drigg and Sellafield, all on the Cumberland coast. Bootle was not available and Courtaulds had bought the Sellafield site to build a rayon factory, so Drigg was chosen. However, Courtaulds decided that there was not enough manpower in the area to support a new factory and decided to move on, donating the site to the Ministry of Supply. The name of the site was changed to Windscale to avoid confusion with the Springfields site near Preston where the uranium fuel was produced. (In 1981 the Nuclear Installations Inspectorate suggested the separation of the works on the site into Windscale Works and Calder Hall Works, with the collective name reverting again to Sellafield). 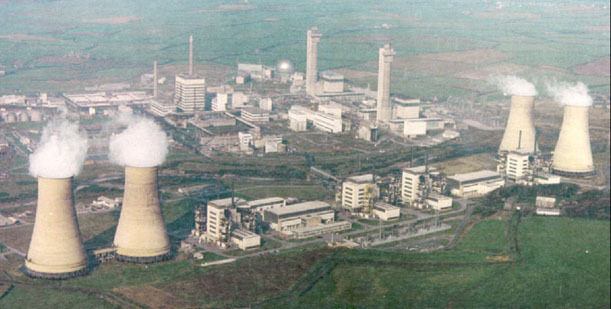 The Sellafield site was much more suitable than Drigg as it had office buildings, railway sidings and some service buildings. Contractors moved in, and those buildings not required on the site were cleared by 1947. The Windscale piles were built with a graphite core and fuelled with natural uranium rods sealed in a can. The heat from the fission reaction in the core was removed by huge blowers and sent up the chimneys through the filter beds at the top, the reason for their strange shape. The only creatures to benefit from this warmth were the sparrow-hawks which made their nests on the filter galleries from which they could swoop down on passing pigeons! 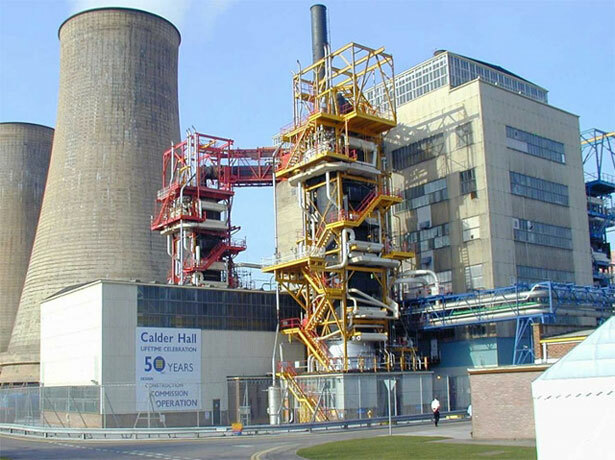 With the experience gained in operating the Windscale piles it was decided that this wasted heat could be utilised to raise steam to drive turbines to produce electricity. So in 1953 the first sod was cut on the south side of the River Calder which bisects the Sellafield site, and three years later – in October 1956 – the Queen switched on the world’s first nuclear powered electricity generating station. Note the time scale – a fantastic engineering achievement built within three years! The original design called for one dual purpose reactor – electricity and plutonium – but this was soon increased to two. 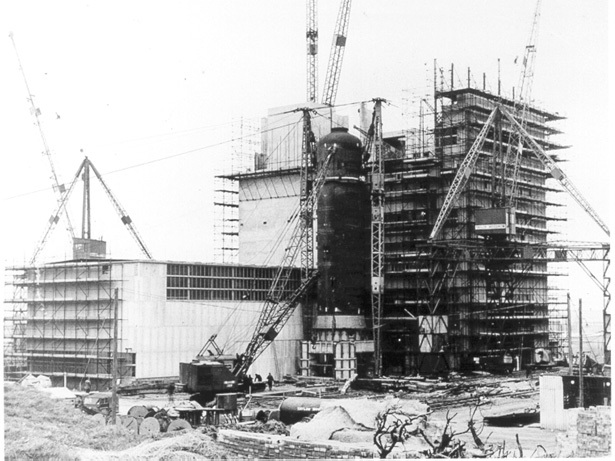 During construction, in June 1955, it was decided to increase the number of reactors to four, with a design output of 4x180MW (Th). Operational improvements increased that to 270MW. At the height of construction 1500 contractors were on site working to exceptionally high standards of welding, accuracy and cleanliness. Tight planning was required – getting the right people in the right place at the right time. Also, to avoid cranes and hoists getting in the way of work in progress, actual operations were rehearsed using scale models. Nowadays this would all be done using computers, as in the building of the Thermal Oxide Reprocessing plant (THORP). To speed up construction many items were part pre-fabricated at the manufacturers and transported in sections to a specially built workshop on site for welding together. For example the heat exchangers (total weight 200 te) were made in Renfrew and delivered to site in ten sections due to narrow roads and weight restrictions on bridges near the site.The inside of the pressure vessel was scrupulously cleaned before each of the 58,000 graphite bricks (all vacuum cleaned and numbered) were passed in to build up the core of the reactor. Each reactor weighed 33,500 tonnes and rested on a reinforced concrete raft 3.3m thick. So how was the reactor controlled? With the control rods fully inserted in the reactor, the 10,000 fuel elements were lowered into place and the control rods gradually and partially withdrawn. When the fission reaction began, power output was controlled by very minor movements of just two control rods. These rods were held in place by electromagnets so should there be a power failure or other incident the rods would drop immediately by gravity into the core and shut down the reactor immediately. Even one control rod dropping into the core would shut down the reactor. A back-up system was also installed. Steel balls containing boron were held in hoppers above the reactor – these could be quickly released to drop into the core and again shut down the reactor. The Nuclear Installations Inspectorate asked for this operation to be carried out at their regular inspections. When Calder Hall was a dual purpose reactor, the fuel elements were in the core for a relatively short time in order to produce plutonium 239 which is the isotope used for bomb making. More recently the reactor was maximised to produce electricity and so the fuel rods could be left in the reactor for years. In this case more of the higher isotopes of plutonium which are not suitable for bomb making were produced. Designed with an estimated life of 20 years, Reactor 1 was finally shut down at 21.05 on March 31st 2003.